Enhances The dispersion of polymer,calcium, & MasterBatch. Enhances the aesthetic looks by making the fabric more white ,glossy,shiny,and lustrous. 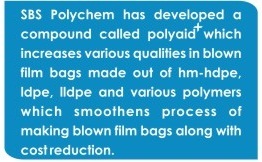 LDPE/LLDPE polymer can be reduced with increase of polyaid+ which will reduce the cost of lamination . Microns of the film can be reduced . Calcium carbonate dosage can be increased.